﻿﻿﻿﻿Three Texas ghost stories passed down through generations. In hopes of saving these folk tales, Juan Sauvageau, former professor at Texas A&M University in Kingsville, published Stories That Must Not Die, a series of books that chronicle Texas mysterious legends as recounted by people who lived in the towns where the stories were first told. 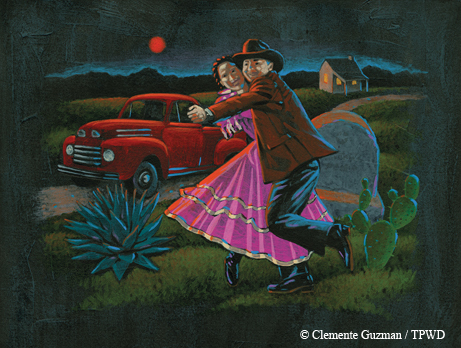 Tales featured in the books, like “Dancing with a Ghost (Bailando Con Un Fantasma),” “The Mysterious Mirror (El Espejo Misterioso)” and “The Sobbing Woman (La Llorona),” are still shared by older folks with children in South Texas. "Dancing with a Ghost (Bailando Con Un Fantasma)"
He stopped and asked if he could assist her with anything, and she said that she wanted to go to a dance but needed a ride. Since he just happened to be on his way to a dance, he invited her to join him, and she happily accepted and climbed into his truck. When they got to the dance, Manuel noticed that she did not do well with new dances like the cumbia, but she was one of the best polka dancers that onlookers had ever seen. After midnight, the musicians stopped playing and María sighed as if she wished they would never stop. When the rest of the partygoers left for home, Manuel and María walked back to his truck. The night grew cool, and he put his coat over her shoulders. María told Manuel to drop her off at the same spot where he picked her up. But Manuel noticed that there were no lights around there and didn’t want to leave her by herself. She thanked him for taking her to the dance but insisted on being left alone. He then urged her to keep his coat and said he would pick it up in the morning. The next day, Manuel, eager to see María, drove back to the area where he dropped her off. Spotting a little white house about a quarter-mile away, he drove down the dirt road and parked in front of the porch. The woman broke into tears. Manuel insisted that María was the woman he had been dancing with the night before, and told the woman that he had loaned her his coat. Resting on the grave was Manuel’s coat. 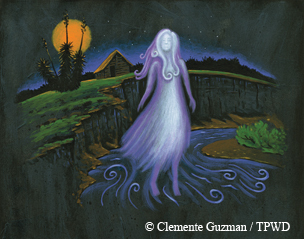 One of the most frequently told stories in South Texas is about a woman called “La Llorona.” Passed down through generations, the Sobbing Woman tale has been interpreted in many ways, and the plot varies depending on who tells it. One version commonly heard around Laredo describes a very poor woman who lived in a neighborhood called the Devil’s Corner. She had three children and lived in a small shack that seemed to hang off a cliff on the banks of the Rio Grande. Her husband often spent his time and money across the river in Nuevo Laredo. She ironed and washed clothes for others, and even resorted to begging to provide just one meal a day for her children. She ate practically nothing herself, in order to save the food for them. The poor woman’s sad life brought new miseries every day. She asked nothing for herself, and it broke her heart to see her children suffer. Her greatest hope was that her husband would come back and that life would be happier. One day, her husband returned from across the river, but he brought only more sorrow, saying he was leaving his suffering wife and their children for another woman. Seeing no end to her agony, she stared at the peaceful river below. She didn’t want her children to live a life of misery as she had, and felt her children would be much better off in heaven. On an impulse, she pushed all three children over the cliff. They fell into the water, floated for a while and disappeared. She smiled for the first time in months, thinking that she had done the right thing. She could see all three of them with a shiny halo already, up there eating a big plate of strawberry ice cream, she thought to herself. She went to bed happy and fell fast asleep. The next morning, she looked for her children and, in a moment of sanity, realized what she had done and wept. Deciding to join them, she threw herself into the river and drowned. Many people believe that when the moon is full, the moaning and sobbing of La Llorona, still looking for her children, can be heard on the riverbank. Ten years after the death of her husband, Bridget Wagner ruled her ranch with an iron hand. Powerful companies were trying to buy land in her area, and they had their sights set on her property next. They did everything they could to get her to sell, but she met every challenge and managed to keep her land. One night, while returning home, Bridget’s pickup truck overturned and she died. Her only surviving heir was her daughter, Gretchen. As soon as Bridget was buried, lawyers went to the ranch and offered low prices for the land. The lawyers told Gretchen she had to accept their offer or risk losing everything. Four weeks later, the lawyers told her she had one day left to sell or they would evict her. Throughout the day, Gretchen sensed her mother’s presence. That night, she had trouble sleeping and had the feeling again that her mother was nearby. Around midnight, there was a noise in the downstairs hall, and she clearly heard her mother’s voice. At her bedroom door, there was a whitish, almost translucent figure leading her down the stairs. 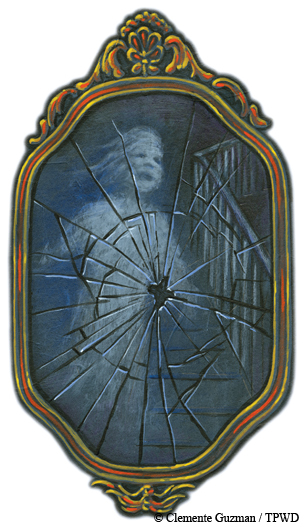 A large mirror in the hall was shaking violently, and it shattered as soon as she reached the bottom of the stairs. In the wall behind the mirror was a safe. The tumbler moved as it was being unlocked: two turns to the left, one to the right, and then the door of the safe opened. And with that, the form disappeared. In the safe, Gretchen found her mother’s will, the deeds to the property and a fortune in war bonds. Instead of going back to sleep, she sat on the porch, waiting happily for the lawyers.